Sharon Joy MacKinnon has over 25 years of experience on the front lines of health care serving predominantly low-income patients in urban and rural settings in the South, first as a nurse, and then as a family nurse practitioner. 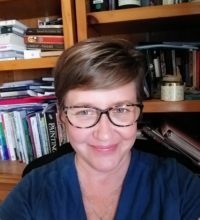 Dr. MacKinnon completed her doctoral work in health services research at the University of North Carolina at Charlotte, directed by Dr. James Studnicki, now CLI’s vice president of data analytics with whom she completed several abortion research publications. Her current research focuses on the development of secure attachments and experiential relational skills training in local faith communities as they relate to the primary prevention of abortion, particularly among populations who have experienced trauma, neglect, and substance abuse. Dr. MacKinnon currently resides in North Carolina with her husband, Michael and their beloved adopted son, Gabriel.